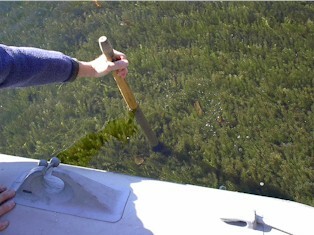 How do I determine if a suspicious aquatic plant is an invasive and report it? Take a digital image of the plant that you've collected. Be sure to use a representative specimen of the plant, with fruit or flowers, if available. Download the image and e-mail it as an attachment to Milfoil@Maine.gov for identification. In your email be sure to include your name, phone number and waterbody name. Mail early in the week so that your sample doesn’t spend the weekend in the post office. Maine DEP staff will identify the plant and notify you of its identification usually within 48 hours of receipt.